Time and energy are valuable assets to frugal living, that's a given. However, they come in limited supply for all of us. Some days, my schedule is simply jam-packed with must-do's. Pushing something to a later date isn't always possible. On those days, a little money spent for convenience, will spare enough time to get it all done. But I don't want to go overboard on the spending for convenience items. It's a simple question, really. How can I make my day work better by spending just a little money? On Monday, I had just those circumstances. Too much to be done. Not much that I could push off to another day. And yet, a frugal meal still needed to be on the table for dinner. I had leftover taco filling that was to become burrito filling, if I made a batch of home-made flour tortillas. Making tortillas is one of my least favorite kitchen chores. It's a work-out on my arms, and it makes a huge mess. Just didn't want to make them. Fortunately, commercial tortillas are also a frugal convenience. Spending just a little money on tortillas could buy me enough time to get the rest of my list for the day accomplished. I was out picking up office supplies, so I grabbed a package of tortillas, spending $1.19 for 10. The cost to make those same tortillas at home is around 30 cents. So my net expense in buying convenience was 89 cents. I saved 30 minutes or more, plus my energy, by not making tortillas that day. It was the least expensive compromise I could make in an otherwise scratch meal. 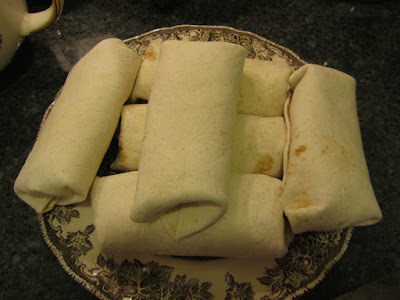 Yet it yielded the same or similar results -- tasty (and frugal) homemade burritos for the family. So, sure, it would have been cheaper to make the tortillas myself. But spending that 89 cents, net, meant that I could get to all of my other work for the day, which I see as a big gain. How true Lili! Most people go into thinking that the end goal of frugality is saving the most money, what is the cheapest, etc. One thing most people don't think of is what is your time worth along with how much would you pay for some peace/tranquility. So you go girl, and buy tortillas when time and energy may not permit, and sit down with family to enjoy a nice dinner! Thank you. I think money is just one of several resources (time, energy, creativity, spirituality are others) that we have to create enjoyable, harmonious lives. Spending a little of any of those resources can be considered a good value, IMO. And 89 cents is pretty awesomely cheap. Plus, the 89 cent expenditure kept you away from Mexican take out restaurants-not teh best option, health wise, IMO, or budget wise. Nope, you were proactive around your time constraints. Perfect solution! Thank you, Carol! And totally agree about the health-factor to a homemade burrito. These were pretty lean, using turkey and homemade beans. Sound like a perfect plan to me. Sometimes we can't do the most frugal thing, but we do something much cheaper than the most expensive thing. You didn't opt for carry out....more expensive.....or going out which also is even more, expensive and requires a tip. Yours definitely sounds like a winner. I think sometimes we think if we don't do the biggest money saver we fail. Instead we need to step back and realize small savings are much better than no savings in lots of area in our lives. Yes! Small savings are better than no savings or overspending! It's something that I find I need to be mindful of. And for me, buying the tortillas worked out so beautifully, as I happened to be in a store that sells food items, so I didn't need to go out of my way, and I had everything else all ready to go for making the burritos. I agree with these two ladies' comments. I do not make tortillas due to how difficult they are to make. Mine never hold together so it's not worth my time. Tortillas are relatively cheap so that's the route we take. I did a bit of cooking Mon. and Tues. I had spaghetti sauce from scratch that I made on Sat. so on Monday I added the noodles, then Tues, was chicken legs and quarters that 1/2 were baked for a meal and the other half I put int the instant pot pressure cooker for a chicken rice soup. We're all set for the rest of the week. It is very busy for hubby who works for a funeral home and he also drives bus for a hospital so he needs to eat quickly when he comes home briefly. I'm at work all day so I know he's getting good food which is always "at the ready". He gets calls many nights so when he comes home at 2 am he will need something to eat. We also love burritos--any kind--but two of our favorites are when we try to copycat Qdoba with meat and rice. Another favorite is breakfast burritos. We also like any form of tacos. Any leftover meat will do for those with a little salsa or cheese in a corn tortilla. Tortillas can be a bit tricky. It's nice to know how to do them. But as they are very affordable at the store, it's not essential to frugal cooking. I think just the effort into filling burritos at home makes them very a frugal meal choice. Oh, I love the Chipotle/Qdoba style burritos! with grilled veggies, meat, beans, fresh salsa, rice -- so yummy! Another couple of months and avocados will be in season again, and reasonably priced at the grocery store (keeping fingers crossed!). Your cooking for the week sounds like it has been very productive, Alice! Awesome job! With both of you working, just imagine how much money you save by cooking at home. Many working couples would be opting for a lot of take-out. You're doing great, IMO! They ARE physically demanding, though, and do take some time and mess to prepare. And we find big packages which are comparatively quite cheap per-tortilla at a couple of places we shop. They're lots cheaper per-serving than a lot of other breads, even at small-package prices; and if you are creative with them, as Alice mentioned, they can really transform a lot of other ingredients. I do like the texture of homemade tortillas more than commercial ones. And I like being able to use half whole wheat/half white flour, for flavor and nutrition. But they aren't a requirement to good homemade burritos. the pliability, for me, seems to be a matter of cooking the tortillas on a high enough temp, so they bubble and brown quickly. And I don't like cast iron for them, as they seem to dry out on cast iron. I use a stainless skillet. I'll have to check larger packages for price per unit. Do you freeze commercial tortillas when you buy in a large package? If I can find them at a good enough price, I may buy a large pack and freeze in smaller amounts. Monday was one of those days that I had a lot to do, and actually had enough energy to get to everything, if I bought these. So it was a good choice for me. I'll have to try using a stainless skillet. Thank you for the tip. :) I might have time to try them out again in a month or so. I haven't bought the big packages in a while (not enough mouths to feed around here, lately), but they lasted pretty well fresh in the fridge, and I've frozen tortillas sometimes. My new favorite thing to do is to make a lot of burritos up at once and freeze them. Then I can pull out as many as I need at a time, and bake them in sauce for mojado burritos (like a Taco Bell enchirito). Not quite instant gratification, but close. You and I have discussed this before, but I was thinking, reading about your tortillas, how I've mostly given up on making corn tortillas and learned to love (faster and easier for me) sopes. We can make just enough for one meal, or some extras to freeze, and then top them as we would tostadas or nachos. They give me a frugal, fast scratch alternative, and are better for one family member's fragile dental work, too. What you're talking about is something that I've ben working on since August, trying to find more energy-conservative approaches to all of my tasks. As well as finding some time near the end of each day to do something that is restful, distracting and recharges me for the next day. I will look at that link. Thank you! Kris, thanks for sharing the link to the PDF. I would have totally gone with the purchased tortillas, too. I used to run myself ragged trying to do everything from scratch and by hand. Going back to school forced me to adjust my thought process. Sometimes I have to go for "good enough" as opposed to the ideal answer. Turns out my family is just as happy with alternatives when time requires them. yes, running myself ragged is an apt description for how I felt this summer. There's only so much a body is capable of. And when you add when you add in something extra like going back to school, that's enough to push a person over the edge! Time for some changes. Have a great evening, Busy Bee! I checked out that link. Thank you. It does have a lot of good information. I have been doing much of it, just as a way to get by and still get things done. What I'm not good at is resting throughout the day, and pacing myself. I'll have to work on those. Again, thank you! Thank you for posting the link. I struggle with pacing and adding in rest periods on days when I am feeling well. An interesting item from the PDF, Kris, was about crossing your legs when you sit. I've been much more aware of that the last two days, and am trying to break that habit. It's a hard habit to break, though! Something the PDF doesn't mention that I like to bring up with my patients is to limit overhead arm activity. Activities like washing shower walls (or any walls), painting, changing lightbulbs overhead, are tiring because when your arms are overhead your heart is working harder to pump blood uphill and that is tiring. Kris, I hadn't thought about the heart having to work harder when your arms are overhead. But that makes perfect sense. hate thing. I love the taste and hate the work. Good for you choosing a balanced approach. I'm the same way with fresh out of the oven French bread. I can eat slice after slice. So yummy! Love-hate thing on the tortillas for me, too. I've taught everyone in the house how to make them, but no one has the time, these days. Oh well, commercial tortillas will have to do this week. Btw, we freeze tortillas with no problems. true. I couldn't have bought carry-out for 89 cents. The purchased tortillas were a value item, in that regard. Good to know about freezing tortillas. I'll compare prices on the large packages at the wholesaler. LOVE this post! Store bought tortillas have definitely been on my list of guilty pleasures this year. You know, many years ago I had a frugal revelation about convenience foods. I was working late nights at the music school, so I'd get home after 10pm starving and exhausted. At that point cooking was usually more than I could bear, so I'd end up stopping at the local fast food or Chinese restaurant. One day it finally hit me that aiming for perfection in the kitchen was completely backfiring. While frozen entrees and canned veggies might not have lived up to my culinary expectations, it was certainly a better option than beating a path to the local junk food eatery. And then when you're not exhausted and strung out over busting your budget all the time, you actually have more energy to cook when the opportunity presents itself. Never let the perfect be the enemy of the good! Good revelation on your part. I agree that trying too hard does backfire. We need to make compromises, here and there, just to stay on course. I would imagine that it was very easy to slide into the habit of fast food, when you were working late evenings.Who wants to get home late, be tired from working all day, have zero inspiration on what to cook, and then go into the kitchen to create something gourmet from scratch, and just for one person? It would be sooo easy to drive through some place for dinner. And you're right about not stressing so much leading to more energy to do other things. I agree with everyone, that a little convenience is worth a lot sometimes!! On the subject of flour tortillas, I love homemade far better, so we freeze a batch of about 24 tortillas at a time. Of course, my husband and I do it together, so that makes a big difference. It is almost enjoyable, since we play music and talk while we do the rolling and frying. Yesterday, I tried baking a sheet of bean mixture. It took too long, about 30 minutes on each side at 350 degrees in the toaster oven. I ended up frying the rest in patties. It takes a long time to brown the top, not like meat since it has only the oils we add to the mixture, so I will not bake again. I've been so mentally exhausted lately. I don't miss reading your blog, not a single day, but sometimes I don't find the words to comment. I am so sorry that you're feeling mentally exhausted. I can understand how trying that is. I hope that you can find solutions or rest, to feel more like your normal self. It's miserable to not feel well for a long time. Natto-slimey, hmmm I'm not sure I'm game to try it. Thanks for the feedback on the baked bean burgers. I'm also thinking I could make a large skillet at a time, all one patty, then cut into wedges. This would work for our family meals. I'll give it a try soon. Feel better, YHF! I'll keep you in my prayers. Thanks, Lili, for your kind thoughts. I know this election season has taken a toll on my psyche. I hate all forms of violence, whether physical use of force or mental cruelty like bullying. My own mother was a bully using the cruelest form of punishment, ostracism, repeatedly, well into my adulthood, and only stopped when I had confronted her that my psychologist called it abuse. Her bullying prevented me from taking ownership of myself, from knowing and liking me. Till today, I can detect anyone who does that to me or another person, it can be as slight as unkind remarks. YHF, I think a lot of folks are struggling with this election. It's been more volatile and in the news everywhere you turn. I understand completely, how it could trigger feelings for you. I've been praying for you. Have a lovely weekend, and do something just for you.